"I'll tell you a secret I've never revealed: however we are is okay"
I think Hitchens (Christopher) was referring to religion when he said that, but a quick Google search doesn’t reveal the source of the quote. It certainly applies to religion. And it’s a statement that I find powerful and true, and is a useful tool in trying to weed out sloppy thinking in yourself and in others. This is a threatening idea, to the culture and to individuals who base much of their identity on their gender. And it would seem that gender-as-performance is a mere assertion, not accompanied by evidence the way, say, practitioners of evolutionary psychology attempt to use evidence to demonstrate their truths. I don’t know if this assessment of both sides is true in an objective sense, but I know that many people would see it this way. So my question is, if gender-as-performance is merely being asserted without evidence, can it be dismissed without evidence? At one point in my life I probably would have thought so. Having Hitchens’ razor at my side to slice this idea up would have made me feel quite powerful. But I was forced, or cajoled, under several different circumstances to instead give the idea a chance. It sank into my mind and took root, and slowly it started to make sense. 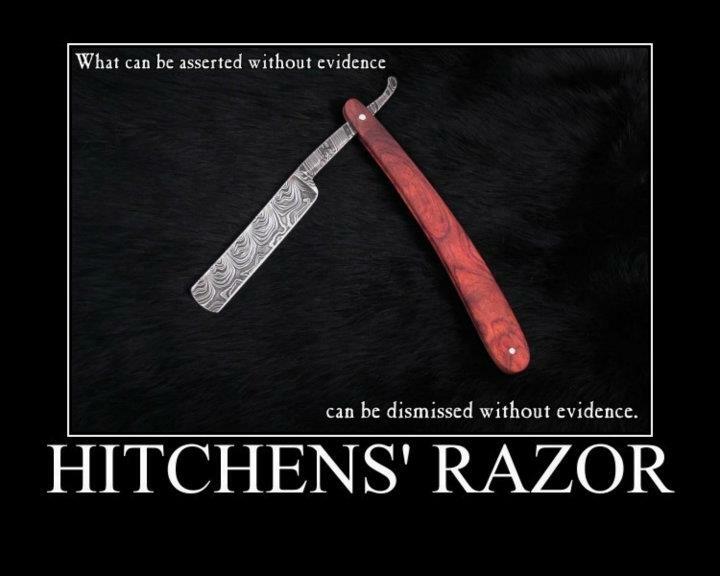 And then I realized an important corollary to Hitchens’ Razor: the lack of evidence in support of something doesn’t make that thing untrue. Humans don’t know everything. The way I understand it, Butler came to her ideas by intuition when she was young (first paragraph in 1990 preface to Gender Trouble). Certainly, lots of people come up with some crazy ideas when they’re 15, and even crazier ones when they’re 35, so someone “knowing something to be true” is no reason in itself to have to take it seriously. Life is short, there’s only so much time to consider crazy ideas. And we could even summon perfectly reasonable reasons to not give Butler’s idea the time of day: if you see her (for example in the philosophy film Examined Life), you realize that her performance of gender, as it were, is somewhere right in the middle between what the culture at large would consider masculine and feminine. So of course she’s going to think gender is a performance. Makes perfect sense for her. But that doesn’t make her theory apply to the rest of us. But that does a disservice to her stroke of insight. We can flip it and see that she was just the type of person, because she was so down the middle gender-wise, who would be able to see and articulate the truth of this idea, which most of the rest of us, acting out our gender in the culturally acceptable way, missed. And we can be led to take the idea seriously when we get to know first how committed she is to it and second how many other people, when they hear it, find that it makes sense to them. Butler’s Gender Trouble was a sensation, in academic and feminist circles, when it was released, and it continues to resonate with many people, and this often indicates that the idea hits at the core of something many people have felt but have not been able to articulate. If something strikes a chord with a lot of people, it is at least interesting to consider what it is in the idea and the people that is connecting. Now, I’m not proposing that this is any kind of algorithm to find the truth. You can’t just believe anything that is fashionable or popular. If that were the case, I’d have to be down with The Secret too. The deeper point is one I will return to often, which is to consider why you are so quick to dismiss an idea that one very intelligent person has put forth and many other intelligent people find quite agreeable. Is it because you are threatened by it? The work required in dismissing such an idea is a lot greater than simply whipping out your Hitchens’ Switchblade and cutting it down. Because what evidence could there be that gender was a performance, especially when the idea formed in the first mind? How are you going to prove that? It seems to me that this is the kind of idea that has to take root first, and then evidence for and against it can be found. The world of human culture is not as easy to extract evidence from as biology. But that doesn’t mean there aren’t truths hidden in it that can be brought out. Often the way to see those truths is through strokes of intuition, the subconscious ordering of all the cultural input we get, not evidence. Someone else’s intuition need not be accepted, but if you can let yourself not be threatened by it, then it need not be rejected either. In the end, I’ve found this stroke of insight of gender as performance to be transformative to the way I see myself and the way I see others. In the end, I still believe men and women do tend to be biologically inclined towards different behaviors and desires, so I am not a strict Butlerian, but the idea of gender performativity has enabled me to see much more clearly the extent to which culture amplifies those tendencies. And this has made me a much freer person.